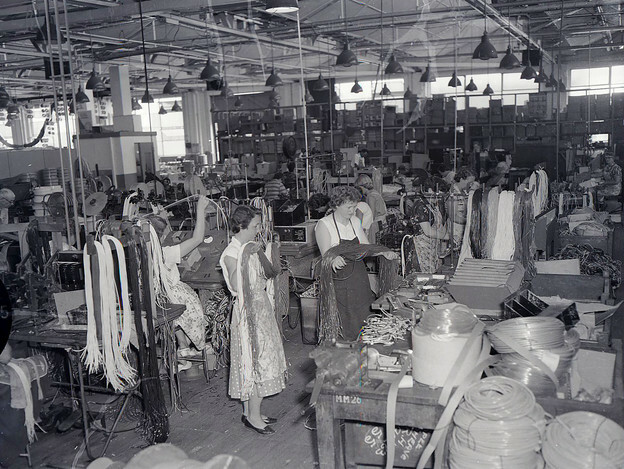 Women on factory floor, 1960. Note: Poet, novelist, and playwright Leslie Kaplan came of age in 1960s Paris. At that time, France was defined by a particular brand of conservatism, even while tumultuous events called out for a commitment to activism. President Charles de Gaulle had successfully pushed for strong executive power when a new constitution was written, founding the Fifth Republic (1958). De Gaulle believed that a united and powerful France could re-emerge from war and postwar challenges through fidelity to traditions and commitment to social stability. Attaching paramount importance to French identity and destiny meant paying little heed to the varied needs of working-class people and other vulnerable populations. Within this ideology there was much to concern those committed to social justice. At age twenty-one, with the desire to redress inequalities, Kaplan traveled to newly liberated Algeria to teach French; back in Paris, she taught courses to workers who had little or no access to the French University system. Soon after, as a university student of philosophy and history, she joined the radical student group, the League of Young Communists (Marxist-Leninists) (UCJML), which had split from the French Communist Party. The UCJML had their own list of principles, including their adaptation of Mao’s notion that it was essential for revolutionary intellectuals to work alongside the proletariat. Kaplan and others who called themselves “établis” took jobs in factories, with the intention of identifying and joining radicalized workers in revolution. The protest movements of May 1968 would soon gather force, particularly at the Nanterre campus. Soon after, a general strike broke out throughout France involving several million workers with an energy that seemed to the activists to mark the beginning of a new order, or a new France at least, liberated into communism. The hopefulness was short-lived, however. In late May, de Gaulle ordered striking workers back to their jobs, saying that if they refused, there would be a state of emergency. He also announced a referendum to be held on June 23, and his party overwhelmingly won. It was a return of the usual order. Despite this crushing disappointment, Kaplan went back to the factory in the fall of ’68, remaining for another two years, feeling that there was still something to be learned there. Ten years after these transformative events, Kaplan began L’excès-l’usine, her first book (to be followed by over a dozen other publications). Faced with the desire and the ethical summons to write about an alienating and often hidden place in society, Kaplan wrote L’excès-l’usine with a new strangeness that acknowledges the distances that factory environments generate between people and between people and objects. Kaplan’s poetic voice circulates through the factory with its heaps of wire and sheet metal; its assembly line rhythms and its open yards. As such, she renders into poetry what is political life — the position of the workers in the factory and their isolation from the value they are producing. The book’s publication (Hachette, 1982) immediately sparked a variety of strong responses, including an extensive interview with Marguerite Duras, and a review by Maurice Blanchot in Libération. There were also television appearances, radio interviews, and reviews of the book in literary journals across France. Julie Carr: Can you describe the political activities you were involved with in France in ’68? How did you find yourself in the factories? Leslie Kaplan: I decided to go work in factories in January ’68 as part of a movement of students who were influenced by what was going on in China, which was undergoing a cultural revolution. The idea was to make an alliance between intellectuals (teachers, students) and the working class. At that time there was a big ideological battle between China and Russia; the Chinese saying that the Russians were revisionist, really giving up on the idea of revolution. The Soviets, on the other hand, would say, “We have to adapt to the modern world and become reformist.” In France at the time there was a very strong minority of activists that considered themselves pro-Chinese. Carr: What were some of the other political concerns that were in the air? Kaplan: You could really feel politics in your everyday life. During the war in Algeria, the question that opened a lot of young people’s eyes was torture. All of a sudden it was revealed that the French government was hiding, but nevertheless promoting, torture. During and just after the war for the Independence of Algeria in 1962, there was much violence; there were bombs in Paris. The extreme right, who had wanted to keep Algeria French, bombed buildings, trying to get (culture minister) André Malraux, but the bomb fell on a little girl, a four-year-old girl who went blind. There were big demonstrations then. The independence of Algeria also raised the question of immigration. And there were some very strong sentiments against American imperialism in Vietnam. Carr: How did your own studies fit into your political activism? Kaplan: During the war in Algeria I was in my last year in high school, which is called terminale, studying philosophy. From there, I continued to study philosophy and history; basically, that’s what I was interested in. I learned a great deal by working with people who were trying to become literate — the enormous difficulty of that — I learned what it means when people can’t adapt to society, or experience extreme struggles in adapting. This was a very important experience, what I would call le poids des choses, l’inertie. I began to really feel the material difficulty of environment, of course racism, and how that affects people, but also I was learning to see how people think. This is the context in which we entered the factories, influenced by the idea of Cultural Revolution in China. Jennifer Pap: At what point were the truths about the Cultural Revolution in China revealed to you? Pap: Kristeva’s book Des Chinoises (About Chinese Women) came out of that. Kaplan: I won’t forget that Kristeva, like Barthes and Sollers — that group of intellectuals — they became pro-Chinese even later than we did. But when they went there they saw only what they were shown. They had an experience of seeing and admiring what was shown to them, of writing books about that, which they dropped pretty soon after. When we did discover the truth, we were furious and disappointed, but the thing is, that having lived through ’68 and its aftermath, we had already been disillusioned. For some people who were communists in the ’30s for instance, and then discovered what was going on, it was terrible, because for years and years communism had been the thing that helped them live through capitalism. Carr: What changed for you once you entered into the factory? Did you find something you didn’t expect in being there? Kaplan: I found things I hadn’t expected to find, because I had absolutely no idea what to expect. I was very idealistic, young, and naïve, and then I met actual people. I worked in an atelier, a workshop. One of the things I tried to do, according to the plan, was to find “advanced elements” of the working class, whom I would befriend, then I would talk to them about the future revolution and about communism. Carr: “Advanced elements”? Is that a term from Marx, or Mao? Pap: So the workers were responding to news of the student demonstrations? Kaplan: Exactly. This was contrary to what the party was saying, which was that students were not part of the working class, that they were in a conservative position. This is why we were against the party. Daniel Cohn-Bendit was an activist in Nanterre, of French German Jewish origin (I wrote about him in Mon Amérique commence en Pologne). Hannah Arendt was a friend of his parents. He was a remarkable figure because he was sort of an anarchist but at the same time very revolutionary, not just individualist. The activities and the ferment began in Nanterre, where students began to complain about the rigid rules keeping the sexes separate: the girls were not allowed to go to the boys’ dorm, and the boys not allowed in the girls’. Pap: Because resisting moral and sexual codes was part of the movement of revolt? Kaplan: Yes, absolutely! All through the ’60s there were strong remises en cause [challenges] of the bourgeois morale on many levels. As I mentioned, opposition to torture. But also opposition to hypocrisy in the relations between the sexes, in marriage, in the patriarchal way of considering women, which was prevalent during the Pétain period during the Second World War in France (“Travail, famille, patrie”). In ’68, first the university in Nanterre was occupied, and then there were ten million people on strike in factories all over France. What was clear in the movement, though not necessarily formulated as such, was that both the young people and the workers refused to be considered as objects, refused to be used by the capitalist system to produce what the system needed. This of course changed my vision of things. It changed my idea of class, gave me the idea that everything can move around, everything can circulate, you know, that ideas are really mobile, everyone can think and think about things. A very democratic perspective, basically. Carr: How did the writing of L’excès-l’usine seek to address these issues? Kaplan: Well, writing changes you of course. How? You know, as I wrote in a lecture I gave at the New School called “Writing Moves the Sky” (“Déplace le ciel”), perhaps the essential thing about writing is the experience of getting more and more into the complexity of the world through the complexity of language, and with the complexity of language. If you really want to write, really try to find words that correspond to the experience, then the experience itself becomes more and more complex. Carr: The book is really focused on women. In what ways do you see it as a feminist project? Kaplan: It’s focused on women for a very simple reason. In the factories I worked in women were separated from men. But my first published text was explicitly feminist. It was republished recently in a book called Textes premiers. In 1970 there was a newspaper called L’Idiot international that got together with a feminist newspaper called Le Torchon brûle to do a special issue on feminism; they asked me to write. My feeling then was that it was necessary to revolt, as a woman. The text began: “Elles sont des objets, des marchandises” because women were considered objects and felt themselves ready to be sold. Carr: It sounds like you were saying that feminism is folded into the larger critique of capitalism. Kaplan: Which doesn’t mean that women shouldn’t fight for their rights. There should be battles. So, this also means that for me every time there’s an issue — I don’t know — the right for abortion, equality, all the issues — they are important, every one of them, and at the same time it seems to me it’s also important to think beyond this particular issue, to put it in perspective, in a general context. Pap: The context of “the common,” you mean? In my neighborhood where I lived for years and years, there was this woman who would go around, walk around, in and out, and ask systematically, “T’as pas cinq francs?” And what this sentence meant to her was not what you might think. I got to know that she had a house and she did not lack five francs. T’as pas cinq francs, what does this mean? I’d have to know her for a really long time in order to understand what this sentence meant to her. Of course she was trying to make contact, but why with this particular sentence? Who knows? There is a way of staying open and not closing things in, people in, sentences in. This is the most important thing because what “they” are trying to do is put things in boxes, people in boxes, sentences in boxes. Pap: I’m thinking about the two books that come after L’excès-l’usine: Le livre des ciels and Le criminel. Did you keep thinking about the experience of établissement through the writing of the other two books? Is there something you could say about the spaces these books create for the subject, for the theme of crime? Kaplan: Well Le livre des ciels is a continuation. I’ve said that the two books are “under the same sky.” There is a je in Le livre des ciels, though it is still a very abstract je, rather than a je that inhabits herself. This je mixes with somebody who is also working in a factory. I included a lot of violence there, which was a very conscious decision. What I wanted to do in Le criminel was to try to write time, the development of time. A narrative. In the two first books you are in a world where time does not move. In Le criminel, you could say that something happens, it is not necessarily named, but it does have an effect since Jenny leaves “le chateau.” For me it was very important to see if I could write a narrative. It wasn’t just curiosity but a necessity, to write the experience of time. This had to do also with a distinction I made then between “le crime” and “le meurtre”: crime and murder. The reference to the criminal in the book is a sort of metaphor for something extraordinary happening, whereas on the opposite side is murder, murder being repetition. That is, you have violence that can open things — criminality — and violence that just perpetuates the same thing, which is repetition and murder. Carr: So it was important to engage narrative as a developmental process which stands in opposition to repetition and sameness? Do you want to say anything about the relationship between narrative and prose? Kaplan: Poetry, prose, poetry, narrative — a complicated question. Frankly, I never thought, “I’m going to write poetry” or “I’m writing a novel.” I’ve always thought, just try and approach such-and-such a question. For example when I tried to write the experience of ’68 in the book called Miss Nobody Knows, the figure of Miss Nobody Knows appeared, somebody who is asking questions. I really wanted the reader to feel what the experience had implied, not just read about it, but feel it. The figure of Miss Nobody Knows is a “poetic” figure who goes through the book asking questions and writing them in her notebook. She then disappears, “like” the movement of May itself. When I wrote Mon Amérique commence en Pologne, which is a form of fragmentary autobiography, the fragments were totally essential to the project, so that people who read it would understand the feeling of the ’60s through the music, through the things said. Carr: Were there poets and writers who helped you move toward this looser relationship to form or to genre, who inspired your work early on? 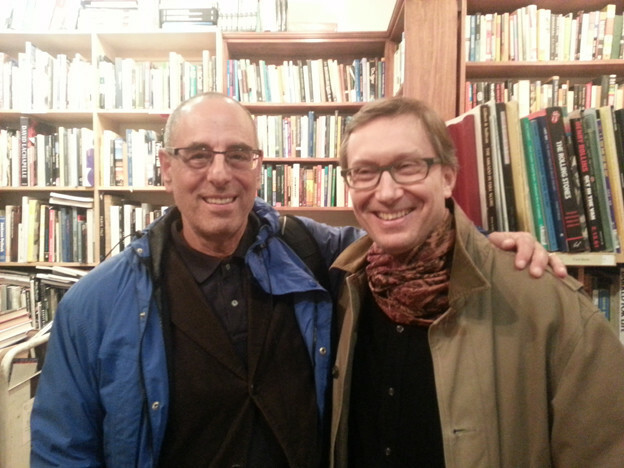 Kaplan: What I read, I read enormously — a lot — and then when I decided to write (because it was really a necessity, I had to write) I read Rilke and T. S. Eliot for the rhythms. I’d go back to childhood things, Alice in Wonderland, Winnie the Pooh, things like that. I think it really had to do with the rhythm. Carr: Is there something about writing between two languages? Importing the rhythms of English into your French? Kaplan: Donc, yes, definitely. I’ve always said that there was English under my French. I was also looking at painting. Cézanne was very important. And Cézanne himself, who wrote very little, did write the sentence: “Je vous dois la vérité en peinture.” So of course you want to give people the truth in writing. Pap: In the interview with Marguerite Duras about L’excès-l’usine,you repeat the word enlever as you talk about how much you had to take away to get to the truth of L’excès-l’usine. So how do you find the words that give the sense of truth that you are after? Kaplan: Well that comes back to the whole process of how when you’re writing … it changes you. You could begin by writing enormously: this, that, and how she was here and he was there, but then you realize that when you are doing that, you are not really creating the sensation, the feeling, the sensual feeling, the material feeling. When I wrote L’excès-l’usine I came little by little to think about the difference between anecdote and detail. A real detail is the condensation of many different levels, an infinity of levels. This detail opens up an enormous quantity of worlds. An anecdote, in contrast, just keeps you there. I mean, everybody likes anecdotes, you can tell stories, but it’s not necessarily what you are looking for when you’re writing. People go on a reality show, for example, and tell anecdotes about their mother/father/husband/wife/children, and really, nobody could care less, themselves included. It’s not interesting at all. It just repeats (to go back to repetition) the eternal violence that of course is there for everybody always. Pap: Let’s talk about the ninth circle of L’excès-l’usine. A conversation occurs at the end of the book, even as there is a change in the setting. … It brings L’excès-l’usine into another realm, where people converse. There are three generations (if you count the baby). Kaplan: The scene is important because it shows in a different way what repetition, murder, violence really is, because it’s happening to a child, by a child, and through a child. Carr: We are wondering about the last line, “Do you think I’m going to kill you?” that the child says to the baby. One way to read it is that the child is voicing the voice of capital or the factory, and the repetition, or murder, is coming from these institutions. Kaplan: She’s asking the child, and of course the child being a baby can’t answer. Pap and Carr: We think of it sometimes as a doll; it has rubbery skin. Pap: That makes it much more troubling. Kaplan: Yes! The opening comes from the fact that there are words. The mother says, “Tu vas le tuer” [You’re going to kill it] and the little girl says, “Tu crois que je vais te tuer?” [Do you think I’m going to kill you?]. Now, this is a very small opening, but an opening nonetheless. The question the girl asks is also her question to herself. The whole book, how should I say, capitalism (society) is something that makes you, but at the same time, like Sartre always said, the important thing is what you do with what people have done to you. Because you use words, language, you can create an opening even if it is very small. When I began writing the book, I told myself, this is not Germinal (Zola) because I did not feel that everything is impossible. Everything is terrible, which is not the same thing [laughter]. Non, mais c’est vrai. The form in Germinal is naturalistic, and I did not want that. And I’m sure that’s why even in L’excès-l’usine there is also a lot of sky. Pap: The sky is there. Kaplan: The sky is there because it has always been there. That’s part of the writing. Pap: That may go to our questions about politics and psychology. We find that L’excès-l’usine moves frequently between politics and psychology, or what one could call trauma or even deep memory. The speaker is investigating within and without, blending real world materialist insight with interiority. We felt this was very particular, and in translating we felt this very vividly. Kaplan: Well, I’ll tell something which has to do with what you’re saying. When the book was finished, but before it was published, a friend read it and offered an interpretation I hadn’t expected. He said, “But there are so many trains, so many rails, so much fire, this is also a book that has to do with the camps.” He was right, in a way. This also came up in my conversation with Duras. The fact of my being Jewish, the fact that I went to work in a factory to begin with, I think — in fact I don’t think, I’m sure — has to do with something that is unconsciously there. Carr: Were members of your family in the camps? Kaplan: Not in the camps, they were exterminated in Poland. They didn’t get there; they were killed. The parts of my family that survived were in America, my mother’s parents and my father’s landed in New York and New Jersey. Whoever was left was killed, lost. This dimension of real irreducible violence, which I absolutely believe is an aspect of the factory, was very scandalous for everybody when the book came out, including people who belonged to left-wing unions. It was a little too much, they’d say, you’re exaggerating. Pap: The left found L’excès-l’usine scandalous? Pap: They wanted to see the seeds of activism in it? Kaplan: If you say that factories create alienation, if you say that industrial work, serialized work … there’s a real problem. Pap: Because they want to believe that the workers will create the revolution? Kaplan: Look, even M. Duras, she says, “quand même, ils ont leur vie.” [“even so, they do have their lives.”] It’s very difficult to live with the fact that so many people live a type of life that is so awful. What do you do with that? It’s a question that you can’t avoid (well, you could). At the same time you’re living your own life, I hope, to the most. But at least you shouldn’t erase the contradiction, the conflict, that exists. And finally: politics for a writer is what? It is choosing a certain point of view concerning language, and it can be in many ways an open point of view, you find a language that does not repeat what the world insists on repeating. Your way of treating language, your way of using words, your way of using sentences, is not moving in the same way that is imposed on you. An honest poet always resists. 1. A longer version of this introduction will appear in Leslie Kaplan’s Excess-The Factory, trans. Julie Carr and Jennifer Pap (Oakland, CA: Commune Editions, 2018). 2. From the verb “établir,” to establish. They “established” themselves, took their places, as workers.